How much space are you can you reasonably occupy in public before you're considered obnoxious? In New York City, we spend a lot of time in close quarters with strangers, yet this has not diminished our sometimes ferocious responses to invasions of what we feel is our personal space. But my question is this: in public, how much personal space can we reasonably claim for ourselves before we start to infringe upon the space of others? 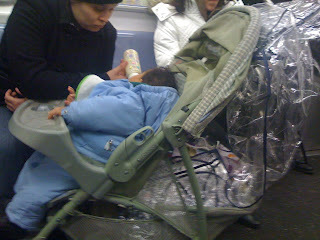 This woman was tending to an infant, and I am sure that this held the annoyance some people may have felt in check. But this is not an uncommon occurrence. Sprawlers on mass transit are fairly common, particularly during non-peak hours. And on the LIRR, commuters have developed extensive strategies to claim space for themselves. For example, the seats are arranged in rows that can feasibly seat three people, most riders will occupy either the aisle or window seat and will use the middle seat as a "communal" space to store bags and other personal effects. In two-person rows, a common tactic for riders who want the row for themselves is for the rider to take the aisle seat and place a personal item in the window seat. 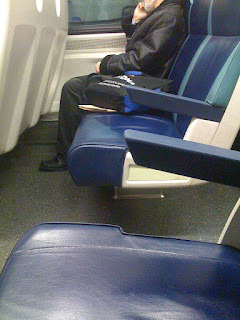 At a glance, the row looks full, and most people don't want to ask others to move—it does happen, but it often feels like a production as the seated person who has to move will grab his or her bag(s) and/or package(s),appearing to bulk up in the process, and tends to sit down again with much reshuffling. There are overhead racks on the LIRR that can be used to store items, but these aren't used very frequently. 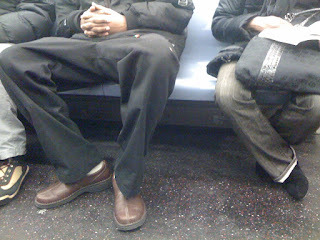 Or is this simply a NYC (or urban) phenomenon? Perhaps people are perfectly reasonable about sharing space in other places. What do you think?